George Clooney, the handsome smirk that came to life one day when a charming angel blew an air kiss to a three-piece suit, is married to a fancy upper crust British lawyer type, so it makes sense that his British TV debut would be on a show about fancy upper crust British types. 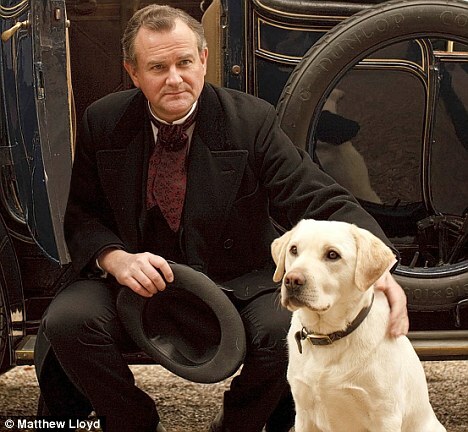 But since Keeping Up Appearances is only airing new episodes in my dreams (not to mention that Hyacinth Bucket would NEVER with someone as déclassé Booker from Roseanne), he had to go with the next best thing, Downton Abbey. And in case you’re not a person from the UK, you’re probably wondering what the hell Text Santa is. Apparently it’s (“Oh boy, here we go…” said all the British people) a fundraiser/telethon. So maybe George’s appearance on DA is like a charity auction thing where he donated a bunch of money in exchange for a walk-on role. Or maybe he just wanted to hang out with Isis the dog? Yeah, that’s probably it.